We live in a highly connected world. According to a recent report by Gartner, by the end of 2018 more than 4 billion IoT (Internet Of Things) devices such as smartphones, tablets, notebooks, wearables etc. will be in use. These devices have changed the lifestyle of ours and have made our lives more comfortable and efficient. The easily accessible technology has led to an increase in the number of connected devices in our homes. Artificial intelligence companies have made our world smart and simple. The proliferation of IoT devices and sensors though have made our world smart but at the same time have made us extremely vulnerable to cyber attacks. The comfortable confines of our homes are no more safe from hackers as handling numerous updates, settings, passwords etc. for multiple devices simultaneously is not an easy task. So a number of legitimate questions might crop up in your mind as if how we can tackle the issue of security? or how we can make our homes smart as well as secure? The answer lies in the proper incorporation of Artificial Intelligence and Machine Learning with IoT. The IoT produces a huge amount of data which requires quick and expert analysis. Be it chatbot app development or Tensorflow development, AI has the ability to find and establish patterns to easily handle such big data. So let’s see how a proper mix of AI and IOT can help us in making our homes secure. A few years ago installing a good security camera used to cost a bomb along with monthly rentals. But now with affordable technology, a whole new bunch of security features is easily accessible. The IP cameras are available at a lower price and also the camera data can be easily stored in the cloud. These AI assisted cameras build by the artificial intelligence companies will help us in making our homes smart as well as secure without burning a hole in the pocket. The exchange of data and traffic between IoT devices have a certain pattern. AI consulting can easily detect exchanges that do not fall within the range of established normal behavior and can warn device owners, alarming them about the suspicious activity. The fingerprint scanning a few years ago has a limited accessibility. But nowadays almost every smartphone, tablet, laptop etc. have a fingerprint scanner. The technology though in a beginning stage holds immense potential to make our homes safe and secure. 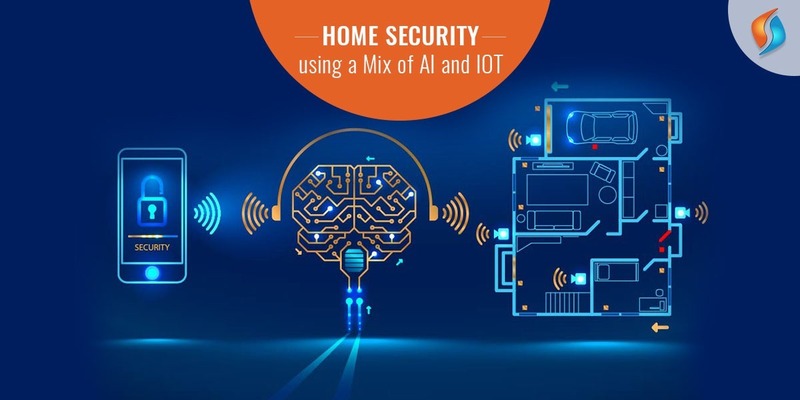 The AI assisted cameras along with under-glass fingerprint scanners will bolster the home security system. The technology is serving the cause of business automation. The AI assisted IOT devices to help us in controlling our homes while being physically away. One of the major benefits of this technology is that it will notify you if anything in your house is removed. For instance, if someone enters your house and removes your laptop, you will immediately receive a message on your phone about the unauthorized entry so that you can set up an emergency alarm. This really improves the overall security of our homes. Hiring the best Machine Learning Developer! The IOT devices along with a proper mix of AI can easily outsmart malware and other security threats. So if you also wish to make your home smart and secure, we at Signity Solutions is at your service. We are one of the best artificial intelligence companies in India have years of experience working on besides being the best mobility service provider in the country. Our dedicated team of developers will give you the home security services of your choice and need. Feel free to contact us and we will revert back at the earliest.